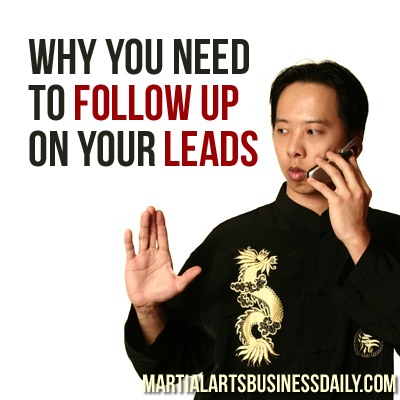 The sad fact is, most martial art school owners and instructors are lazy about following up on their leads. This is BAD for business! It costs you money, every single time you sit on your leads. Why? Because for every hour you wait to respond to a lead, the value of that lead goes down, and the chances that someone else is enrolling that person go up. Find out more about why you need to follow up promptly on your leads, and how to do exactly that, in this podcast episode. Also, Mike reveals a great training opportunity for instructors who want to start offering krav maga in their schools. And, in the Tip of The Week, Mike explains how to use technology to make following up on your leads a cinch. aWeber Autoresponder Service – Click this link for a $1 trial. “In today’s podcast, I’m going to talk about the biggest martial arts advertising mistake you can make. And then later on in the week I’m going to have another podcast episode, which is an interview with Mr. Kevin Hudson. Kevin is a multi-school owner on the east coast, and is also a black under the late great Joe Lewis, and a two-time world kickboxing champion. So, we’re going to talk about his experience kickboxing toward the end of the heyday of kickboxing here in America, right before MMA rose to prominence, and then we’re also going to talk about his experiences training under Joe Lewis. So, it should be a really interesting interview. Now, today on our podcast, as far as our topic today, I think you’re really going to want to tune into this, because it’s something that a lot of school owners drop the ball on, and it’s going to cost you a lot of money if you don’t fix this in your school. Sure, why not? Lots of people have done it. I think Rodney King (Crazy Monkey) even wrote a book about it. I’d take a look at how personal fitness trainers who have home studios are doing it. Just remember that your home owner’s insurance isn’t going to cover you for any accidents, so get a separate insurance policy. I don’t know where to start I need so much help. First I want to say information overload out there. That’s why I chose to only listen to you from now on. I think you are the most honest and sincere consulting in the business. I don’t want or think I can ever get 200 students in the Bronx. I would love to have 50 students. I finally have a big beautiful Empty dojo. Been in business for 19 yrs. move to a bigger beautiful place saving $4000 a year. But no walk by traffic. Help. Would love to talk to you personally and figure out my next step with you. If you have time. 646-423-7898. Merry Christmas from the cold rainy Bronx lol. John, thanks for the kind remarks. What you want to accomplish is not impossible, and definitely not in a metropolitan area with such a high population density. You just need to learn how to market. Let’s talk soon. This podcast is so awesome! I would take my time to call back people that would contact me through my online forms and would never get a response back from them. Then I listened to your podcast last night and just this morning had someone inquire about a class and I called right away. They were happy with the quick response and I have them scheduled for a class this coming week. Thank you so much! Love your podcasts! That’s awesome, George – glad to hear it!